Tiffany is a current university student, entrepreneur, and a quilter who was interviewed in the Autumn 2012 issue of The Canadian Quilter magazine, and who has been the featured artist at quilt shows around Ontario. 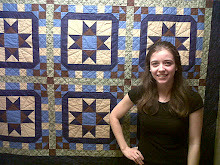 Tiffany will do her trunk show for us, and speak about her quilting history, teaching, and business ventures. After the break, Co-President Laura will reveal the next Presidents' Challenge. We were all very impressed with the creativity shown at the last one. 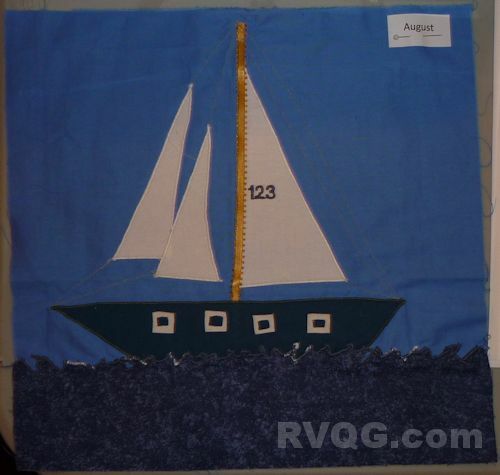 Bring in your completed Sailboat block to display at the Block of the Month table, and pick up the next pattern. Sign up and/or give the first deposit to Ingrid for our retreat at Elim Lodge next October. Speak to Liz to register for the next workshop, the Colourplay Weekender bag with Trisha DellaVella and Mary Eeg on February 16, 2013. Bring your latest finish for display at Show & Tell. Please note that we will be back to our usual procedure of photographing quilts downstairs before the meeting. Although the weather forecast looks ok right now, if there does have to be a meeting cancellation the notifications will go out by email and be posted here on the website around 2:00 pm on Monday. Members without email will receive a telephone call. We look forward to seeing everyone there! Don't forget to bring a mug for coffee or tea downstairs at the break. Guests are also welcome for a $5 guest fee. Happy sewing!